The Prober Shuttle is our latest tool for high-precision in-situ electrical nanoprobing on the 14 nm technology node – and beyond! 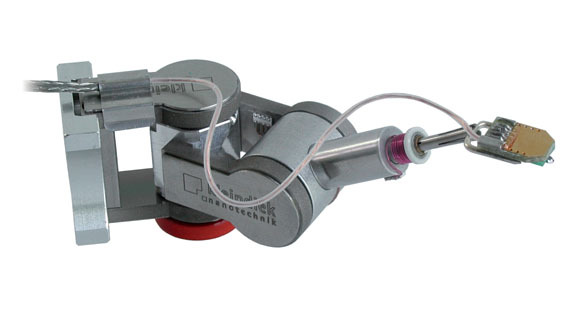 In order to realise our vision for this product, we developed an ultra-flat three-axis manipulator with unmatched stability and precision – the MM4. The Prober Shuttle can be comprised of up to eight MM4s with the option of an ultra-flat two-axis or three-axis substage. The entire height of the system is 10 mm, making it compatible with a wide range of SEM load-locks and thus helping you to achieve a higher sample throughput. The Prober Shuttle also offers low-current, low-capacity measurement capability and is fully compatible to the Advanced Probing Tools hardware and software suite including the Live Contact Tester and Electron Beam Induced Current imaging modules. Click here for further information about ProbeWorkstation. The current challenge in the field of microscopy is to add the ‘hand’ function to the electron microscope to allow physical manipulation and characterization at the micro- and nanoscale. The NanoWorkstation is a powerful, dedicated system that performs such tasks with ease and can be integrated into most commercially available SEMs and FIBs. The NanoWorkstation also contains two RoTip-EM rotational tips that add a fourth degree of freedom to the MM3A-EM. 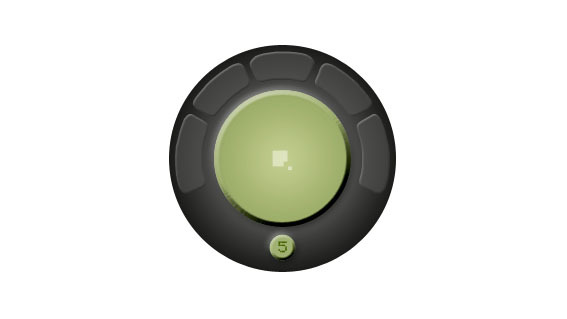 The ‘wrist rotation’ module can be combined with the microgripper or force sensing plug-ins for added flexibility. 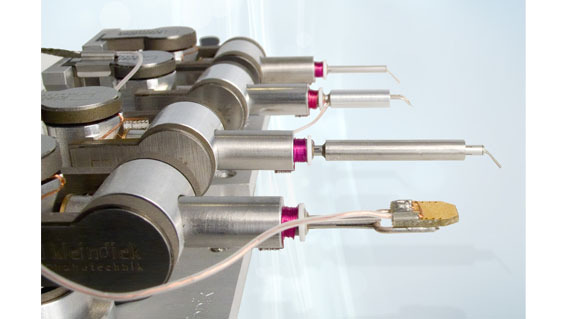 The NanoWorkstation includes iProbe – a mouse control interface for the micromanipulators. iProbe provides intuitive and seamless control of the micromanipulators’ motion using the same mouse used to drive the microscope. Click here for further information about NanoWorkstation. The SuperFlat AFM combines the power of SEM and AFM. Information on lateral dimensions and material from in-situ inspection can be complemented by precise AFM topographical and frictional information. The effortless availability of these two sets of data is unique to such a system and opens new avenues of investigation and characterisation. The most amazing feature of the SuperFlat AFM is its size. 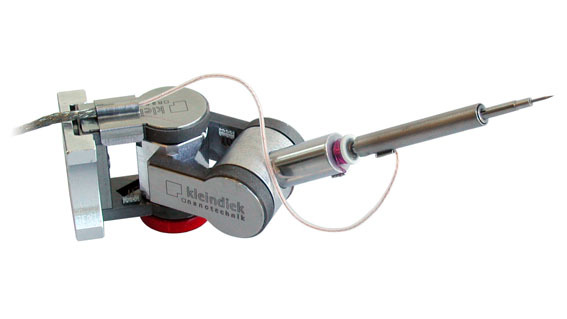 The tool is flat and compact enough to fit through the majority of SEM load-locks, allowing ease of use and increasing throughput. In addition, its size offers enormous stability and vibration dampening advantages, which are particularly attractive when using the tool ex-situ. Design efforts also included ensuring easy handling and tip exchange. A sample or tip exchange takes only a minute and a tedious laser adjustment process is not required. Our customers can choose between two controllers. Please refer to the next two tabs above. Soon also available with the new C3000 controller… Please see the brochure linked in the right side column. Click here for further information about SuperFlat AFM aplications. Click here. 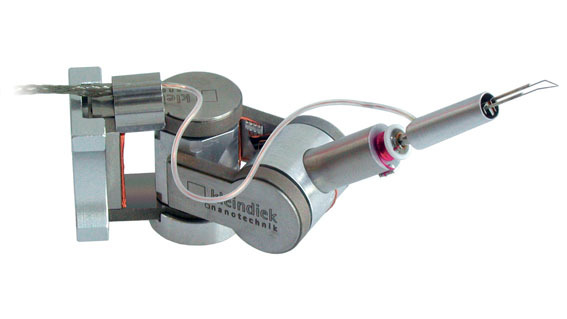 for further information about Micromanipulators.